As a fresh-faced undergraduate student of history, chances are that you will have few opportunities to make a ground-breaking discovery while you’re still at school or university. But, for one group of students at Swansea University, an everyday lesson turned into an opportunity for a new discovery concerning one of Ancient Egypt’s most mysterious pharaohs. The university’s resident Egyptology lecturer Dr Ken Griffin was overseeing a class held in the Egypt Centre stores, a facility at Swansea University where various artefacts from ancient Egypt are kept for students to see and feel with their own hands. During a regular object handling session, members of the class passed around a strange piece of art consisting of two irregular limestone fragments that had been glued together and kept in storage for some 20 years. 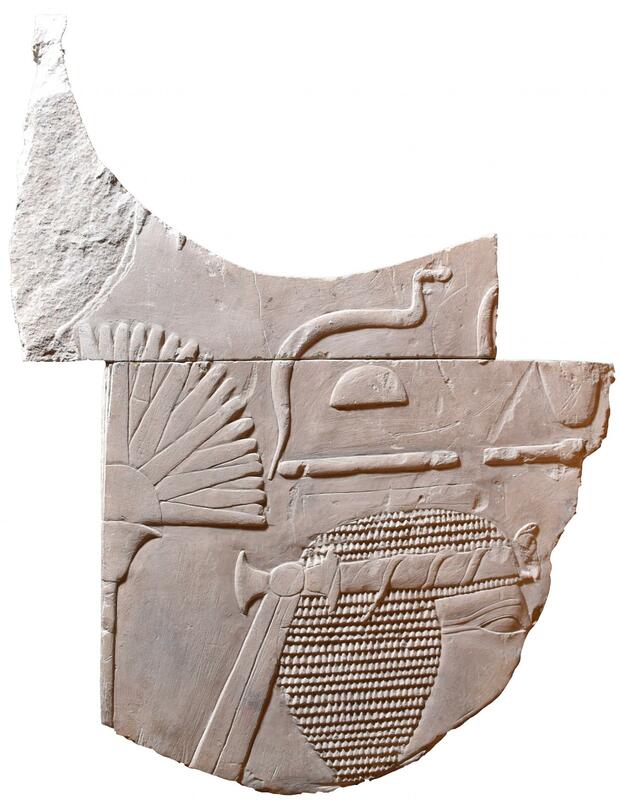 The front of the object – pictured above – depicts the head of a figure, though its face is missing or obscured, while the remains of a fan are shown behind along with traces of hieroglyphs. When Dr Griffin saw the piece, which was requested by one of his students to handle on a whim, he noticed that the particularly iconography on it marked the figure out as a ruler of Egypt, particularly due to the presence of a cobra – or eraeus – on their forehead. After some digging, Dr Griffin learned that there was little information about where the object was found or how it came to be in Swansea University’s archives. It arrived in Wales in 1971 as part of a distribution of objects from the personal collection of Sir Henry Wellcome, the pharmaceutical engineer whose possessions grace many of the UK’s museums. The depiction had clearly been removed from the wall of a temple, tomb or other religious building, as shown by cut marks on its back. Dr Griffin’s first thought was that it seemed similar to iconography he had seen at the temple of Hatshepsut at Deir el-Bahri (called Luxor in ancient Egypt) while the use of a female pronoun to describe the figure indicated it might well be one of Egypt’s queens. Hatshepsut was one of the few female pharaohs to lead the nation, and is considered by many experts to be one its most successful leaders. She led Egypt through a time of unparalleled peace and plenty for almost 22 years and built many temples and monuments, before being succeeded by her son. One of the fascinating aspects of Hatshepsut is the change in how she was depicted in the monuments she constructed. To start, she was depicted as feminine in dress and appearance, but as her reign continued she was depicted in an increasingly masculine fashion, eventually including a full beard. Amenhotep II, her Grandson, is believed to have defaced many of her monuments in an effort to claim her accomplishments as his own. Dr Griffin theorised that this tablet was one such monument, ripped from the wall of a temple, and had been put in the Swansea archives and ignored for many years. He explained: “The identification of the object as depicting Hatshepsut caused great excitement amongst the students. After all, it was only through conducting handling sessions for them that this discovery came to light”.